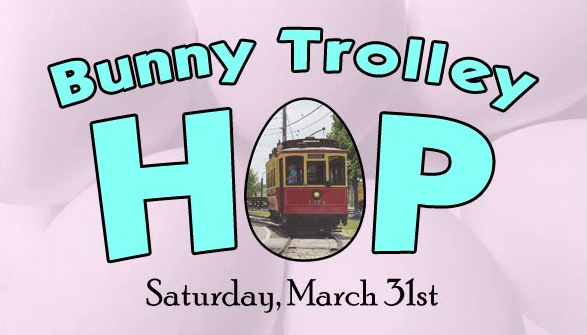 One of the new events that the Illinois Railway Museum has added for 2018 is the Bunny Trolley Hop, a one-day-only Easter-themed event to be held on Saturday, March 31st. The event is an opportunity for parents and children to combine the fun of meeting the Easter Bunny and going on an egg hunt with the excitement of a train ride. Participants will ride the streetcar to different stops along the Bunny Trail to help the Easter Bunny fill his basket. Coloring and photos with the Easter Bunny are included in the event. The Bunny Trolley Hop is a limited-seating event. All tickets are $10 and everyone 2 and over needs a ticket. To ensure that you have time with the Easter Bunny, only a limited number of tickets will be sold for each hour from 10 a.m. to 3 p.m. Tickets will be valid to start your ride in the hour following the ticket time and the last streetcar will leave at 3:45. The trip and activities should take 60-90 minutes overall. Tickets will not be available on the day of the event but must be ordered in advance. Click here to purchase tickets.